Mammut stepped up to the needs of weight-obsessed climbers by creating the 27g Moses Wire Gate Carabiner. This ultralight 'biner should be on your rack whether you cast off for a long single-push alpine climb or 20 pitches of rock. The wire gate on the Moses Carabiner doesn't freeze shut in cold weather and eliminates gate flutter to reduce the chance that you'll load an open-gate 'biner at the end of a 40-footer. 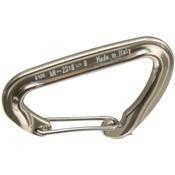 Trad, ice, or alpinethe Mammut Moses Wire Gate Carabiner lightens your rack.